In a panel discussion on data-related challenges facing U.S. national security, Director of Intelligence for U.S. Strategic Command, Rear Adm. Kelly Aeschbach noted, “We do have good access [to information] but almost an overwhelming amount of access. I really think the promise for us in terms of where we’re going with the technology is how do we free the analyst to move to a higher level.” This is an issue faced by federal agencies and commercial organizations, alike. While the problem of data collection has been solved, extracting insights from data quickly and at scale remains a challenge. Augmenting intelligence with machines was a subject touched on by many speakers and panelists. Leveraging AI technologies to discover and use data in transformative ways looks to be a top priority for the intelligence community. As Susan M. Gordon, Principal Deputy Director of National Intelligence, put it, “The race is on for who can put these technologies to good use faster.” She also stressed the importance of responsibility, stating, “These technologies are wonderfully exciting, but if we can’t protect them for our use and ensure that the conclusions that they draw are ones we can trust, we won’t be able to make headway.” This statement resonated with us at Kyndi, as we build our solutions with explainability as a fundamental requirement. With the theme being data, it was not surprising that much of the discussion centered around leveraging emerging technologies like artificial intelligence and machine learning to deal with data at scale. 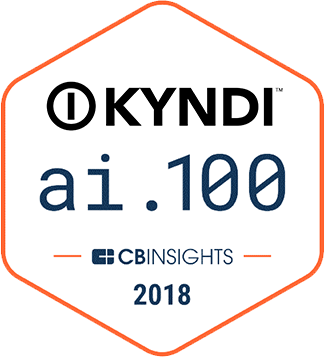 Here at Kyndi, our goal is to help organizations maximize the value of their data and solve real-world problems. If you would like to learn more about how our solutions break open the AI “black box,” we invite you to contact us.